Choose Wiltshire Farm Foods. Join hundreds of thousands of customers. Join hundreds of thousands of customers who are already enjoying our unique frozen ready meals delivery service. 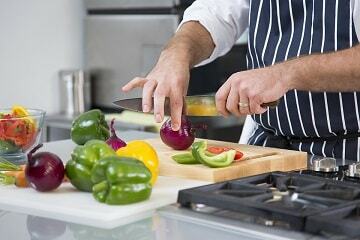 Our chefs and dietitian work closely together to create recipes that taste good and cater for many dietary needs, with many dishes that are low in fat, saturated fat, sugar and salt. We have over 300 ready meals available – shop online to find your perfect dish today. Order when you want and eat it whenever you like – it’s completely flexible. Unlike hot delivery services, frozen food will keep until you’re ready for it. This means it doesn’t matter if your plans change or you’re not feeling that hungry. Plus, you can plan your meals in advance and buy as many or as few as you like. Choose a few dishes when you want them or get a bulk delivery to last you a month – it’s up to you. There is no subscription and no monthly commitment, and you can choose a delivery slot so you know when they will arrive. Ready meals are so easy! There’s no shopping necessary – you won’t need to travel to the supermarket or carry heavy bags home. There’s no worrying about missing some ingredients or having leftover food that gets wasted. And there is no preparation involved, no washing up pots and pans at the end and our ready meals can be warmed through in the microwave or oven. It’s also very easy to order online or by the phone, and you can quickly repeat previous orders. The meals will be delivered to your door, and our friendly drivers can even help you put them away in the freezer. With frozen ready meals, we prepare and cook everything for you, so all you need to do is heat it up and tuck in! We also include everything you’ll need for the meal. Our dishes come with sides and veg, so there’s no separate chopping or preparation needed – it’s all there for you. Plus, our ready meals come in 3 different portion sizes, so there’s different options depending on your appetite. With over 25 years’ experience, we know all about making really good food. Many of our dishes are low in fat, saturated fat, sugar and salt, plus our food is free from additives like artificial colours and flavours. Our dietitian works closely with our chefs to create recipes that taste good and cater for many dietary needs, including Gluten Free, Free From and a specialist softer foods range. We guarantee complete satisfaction with our ready meals. In fact, we’re so confident in the quality of our food that if you’re not 100% satisfied with any dish, we’ll replace it and give you another meal absolutely free. It’s our customer promise. Just keep hold of the film lid from your meal and tell your delivery driver, or get in touch with us by phone or email.